All transactions are safe and secure with a reliable history in online purchasing behind each of our associates. 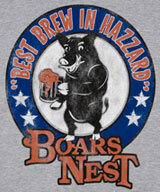 Buy the Boar's Nest t-shirt to own Dukes of Hazzard clothing and merchandise. Go bar hopping in this white cotton T that features a brown Boar's Nest logo on the front. The design includes the bar name, the location, and a charging brown boar. The basement of this Hazzard County watering hole has an escape tunnel, which was used by the Hogg and Duke families during their days of shine running. These Boar's Nest Dukes of Hazzard t-shirts are available in other styles, including baby and kids apparel. Check out the matching hats. In addition to the Boar's Nest tee above, browse the Dukes of Hazzard Clothing Gallery for more apparel like men's and women's clothes, kids shirts or hoodies.